Helpful Tips 1/Burn candles 1 hour for each inch of it’s diameter. This allows the flame time to melt the wax to the outer edge. Burning less time will cause the candle to core burn down the middle& shorten burn time. Example: a 3in/8cm wide candle should be burned for 3 hours at a time. 2/ Use toenail clippers to trim wicks in jars in which scissors won’t fit. 3/Candles will fade if left in direct sunlight or spotlights for extended periods of time. 4/Before a party, light and extinguish candles. They will light more quickly and easily later. 5/ Candles (generally tapers or pillars) refrigerated before using will burn more slowly and evenly. Wrap in foil or plastic before refrigeration to prevent wicks from absorbing moisture. 6/ To extinguish a candle, use a candle snuffer, or hold fingers in front of the flame and blow. This will prevent hot wax from splatter- ing on furniture. Each of our Patrick Coard Paris candles are hand-carved by expert artisans, thus some blemishes and slightly different patinas occur. We consider this to be part of the unique beauty of each candle and the inherit raw nature of it. Pat- rick Coard Candles aim to elevate your experience with our one-of-a-kind creations. The candles are made with some of the best materials including 100% cotton wicks and a blend of mineral waxes. 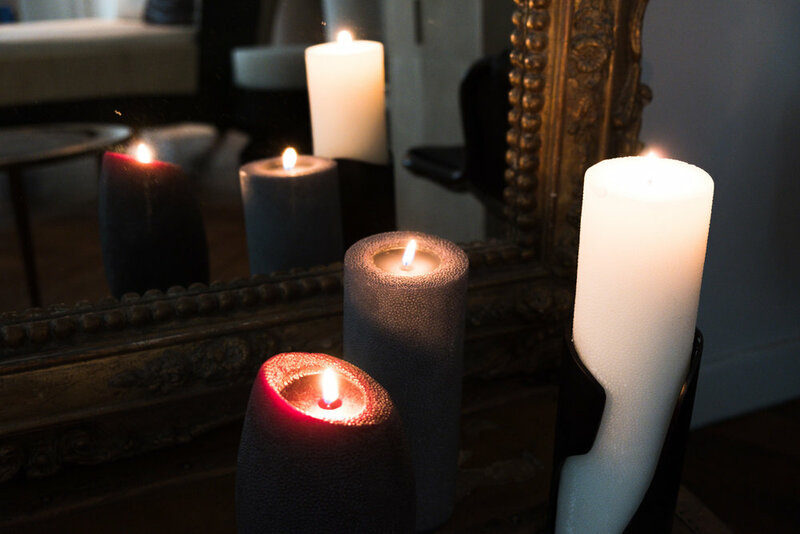 Due to the Candle Sculptures coming in many different shapes the burning experience has been designed to suit each candle. Certain candles will make a tunnel to keep their original shape, while others will burn down letting the sculpture continue to evolve in an unpredictable shape and form. a protected, heat resistant, level surface. 3/Never Leave Candle in Direct Sunlight. 4/ Keep burning candles away from children and pets. 5/Do not place near flammable objects such as curtains, walls, etc. 6/Keep candle free of wick trimmings, matches, or other foreign matter that could be a fire hazard. 7/Avoid burning in drafts. 8/ Avoid walking with lit candles. 9/Keep wick trimmed to 1/4inch/0,6 cm at all times to avoid carbon build up on the wick (mushrooming), dark smoking, and soot in the air and on walls or furniture. 10/Allow candle to cool before trimming wick or relighting. still warm and flexible) and trim the wick to 1⁄4” or 1cm before relighting. Do not straighten or touch wicks when they are cold as they can easily break. Patrick Coard Paris and its partners may not be held liable for any damages or injuries resulting from the use of our candles.